Scientists have proposed a way to build a clock that will keep perfect time forever. The idea for an eternal clock that would continue to keep time even after the universe ceased to exist has intrigued physicists. However, no one has figured out how one might be built, until now. 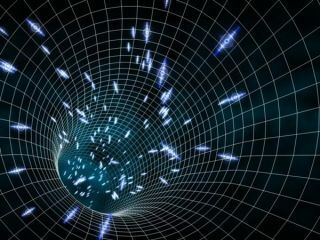 Researchers have now proposed an experimental design for a "space-time crystal" that would be able to keep time forever. This four-dimensional crystal would be similar to conventional 3D crystals, which are structures, like snowflakes and diamonds, whose atoms are arranged in repeating patterns. Whereas a diamond has a periodic structure in three dimensions, the space-time crystal would be periodic in time as well as space. The idea of a 4D space-time crystal was first proposed earlier this year by MIT physicist Frank Wilczek, though the concept was purely theoretical. Now a team of researchers led by Xiang Zhang of California's Lawrence Berkeley National Laboratory has conceived of how to make one a reality. Zhang and his colleagues suggest that a space-time crystal could be constructed using an electric field to trap charged atoms (called ions), and taking advantage of the natural repulsion between two like-charged particles (positive and positive, or negative and negative), which is called Coulomb repulsion. "The electric field of the ion trap holds charged particles in place and Coulomb repulsion causes them to spontaneously form a spatial ring crystal," Zhang said. "Under the application of a weak static magnetic field, this ring-shaped ion crystal will begin a rotation that will never stop. The persistent rotation of trapped ions produces temporal order, leading to the formation of a space-time crystal at the lowest quantum energy state." In other words, the scientists would aim to create a ring of charged particles, with the resulting electromagnetic forces causing the structure to rotate perpetually. At its lowest quantum-energy state, also known as its ground state, the system has no disorder, or entropy, and there is no way for its entropy to increase over time. Thus, the crystal's temporal structure and timekeeping ability would continue even after the universe reached a state of "heat death," also known as thermodynamic equilibrium, when it had devolved into entropy. The researchers describe their idea in a paper published recently in the journal Physical Review Letters.